Two back to back thrillers in two weeks has made me very happy so firstly a big thank you to Blogadda. This definitely is a more adrenalin pumper than the previous book. I have not read the previous books of Ravi Subramanian and this is my first but after reading this I’m quite keen on reading his other three works. 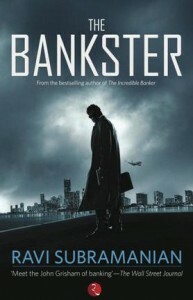 The Bankster is that thriller which you can be easily addicted to. Set in three cities you find three different stories unfolding. Being a banker himself the author kept banking as the backdrop of this global conspiracy and crime thriller. The plot – In the African country of Angola Joseph Bragnanza, a CIA covert agent is involved in blood diamonds and arms dealing. From there it jumps to a small town in Kerala, Devikullam where a 75-year-old man finds himself fighting the government in Gandhian way for clarity in the nuclear program being commissioned in his area. And again, in Mumbai the Greater Boston Global Bank or GB2 unveils the banking rigour, manipulations and power struggle which brings out the various shades of the bankers. All the three plots converge to show the darker side. Ravi keeps the momentum going and unfolds the dark global conspiracy and the world of financial crime. However, I don’t want any spoilers here – so you need to read it to find out about this conspiracy. Analysis – Ravi Subramanian is a banker himself, and thus you know where the sound knowledge and the details of behind the scene banking are arriving from. It gives you moments when you realise though we are surrounded with technology everywhere for efficient/ impartial work it’s finally a human being behind the machines. It’s the human emotion which cannot stay unprejudiced or neutral all the time. From murders to forensic tests the novel creates quite a captivating time. And I truly applaud the author to create this want in me to read more. That’s what makes any book enjoyable. The characters are well thought and well built. Some of the parts are closer to life and seems real. The second half of it is even better. I can see it becoming a Bollywood potboiler in near future. I quite like this writing style as it keeps wading from one plot to another yet not losing the stream. It makes it pacier. My Thoughts – It is a good read and will recommend it. And yes you might also be tempted to read his other works after finishing this.